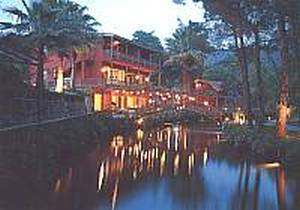 The appeal of Marmaris is in the works of man and nature. It has been endowed with a wonderful harbor. One of the largest and most modern marinas on the Mediterranean, this is one of the best places to charter a Blue Cruise heading east along the Lycian Coast. A regular ferry boat service to and from Rhodes offers an easy way to combine Greece and Turkey. In summer, Marmaris is an organized tourist resort. The town of Icmeler, 15 minutes from Marmaris, lies at the head of a sparkling fjord surrounded by pine-clad hills and offers nice swimming and peace and quiet. 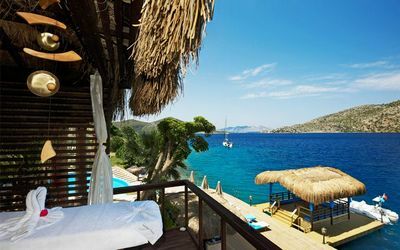 The areas of Hisaronu and Bordubet offer further tranquility, with some very beautiful bays. One shouldn't miss the chance to visit the archaeological site of Knidos, just a short drive away. Yes this is fantasy island, but on a long peninsula outside of Marmaris. Quiet, serene and beautifully decorated, it fits nicely into its natural surroundings. Worth a longer stay than what we usually recommend for Marmaris. For a family or group of friends, this villa offers beauty and sea. 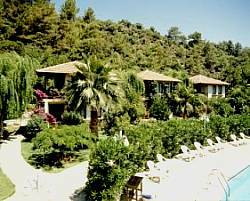 The location makes it close enough to visit many sites like Datca. Villa decor is similar to a ranch style motif. Sabrinas Haus is an exlusive retreat located on the sleepy Bozburun Peninsula, the most romantic Bay where the Aegean unites with the Mediterranean. With only 15 elegant rooms / suites, our attentive staff will ensure a truly relaxing experience awaits you. Accessed via quiet and picturesque roads, Bozburun (along the sleepy Datca Peninsula on Turkey's Mediterranean coast) is far flung and remote. It's only minutes from charming villages of Selimiye and Orhaniye and the Greek Island of Symi is close across the shimmering water. Bozburun is witness to the love of the mythological Gods, inspiring people to describe it as ''heaven on earth''. Sabrinas Haus is the place that love has its most intense effect on earth.